With tyrosinase inhibitors, an enzyme that converts tyrosine to melanin. Melanin is the pigment that gives dark colour to the skin. The more melanin in the skin, the darker the skin becomes. So less tyrosinase leads to a lighter skin. In addition to the proven effectiveness of its ingredients, their collective synergistic actions, and the science that supports their effectiveness, the formula has been designed carefully to ensure that these ingredients do reach the target cells to make the required effect by reaching the target cells (i.e. make the ingredients bio-available). 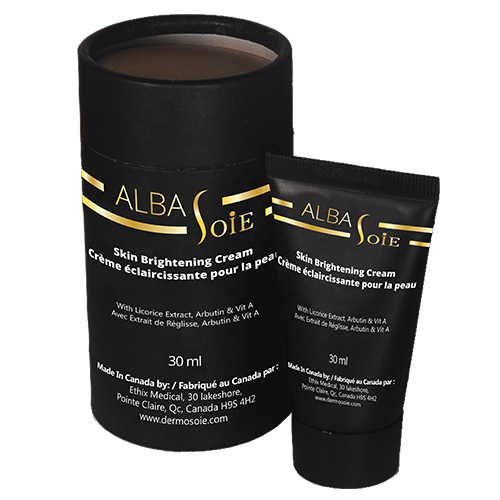 AlbaSoie has been formulated by utilizing the most advanced dermatological advances.